This tutorial assumes you have some previous knowledge of Minecraft modding and have gotten all the initial stuff done (PATH variables whatnot). Feel free to correct me. Check back once in a while for updates. First of all, make sure you have the latest version of Eclipse. Download the latest version of the Forge source from the usual place and extract it somewhere. Go inside the Forge folder. Use the cd command to navigate to the correct directory. You can also hold shift, right click and click Open command window here to open it in the current directory. Replace eclipse with idea if you are using IntelliJ IDEA. If it is taking a long time to download assets, you can skip it by copying the assets folder from your normal minecraft folder to forge-directory/.gradle (so you will have forge-directory/.gradle/assets). 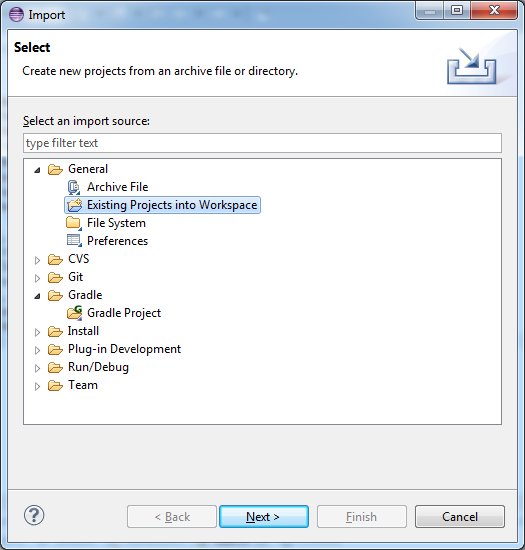 Now open up Eclipse and point the project directory to the eclipse folder. If this doesn't work for you, skip to the advanced setup. You're done with the initial setup! You can now delete or study the example mod from src/main/java and the mcmod.info in src/main/resources. Replace it with your own mod. For those who cannot get the simple method to work. See [iurl=#troubleshoot]the troubleshooting section[/iurl] before trying this method. 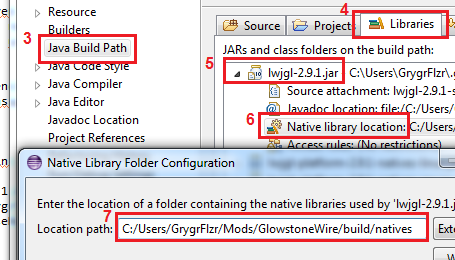 Open up Eclipse, but do not point the project directory to the eclipse folder. Instead, select a new folder (not inside the extracted Forge folder) as your workspace. Go to File > Import... and select General > Existing Projects into Workspace. Do not import a Gradle Project. Click Next and set the root directory as the root forge directory, not the eclipse directory within it. Make sure the project is selected and click Finish. Right click Java Application and click New and you will see New_configuration under it. Now create another new configuration under Java Application and name it Run Server (or something similar). Do not name it Server, it will conflict with the one Forge has. Click Apply. No arguments are required for the server, though you may want to pass some yourself. ForgeGradle allows you to update your dev environment to the latest version of Forge easily. Simply change the version field to the latest version of Forge, such as 1.7.10-10.13.0.1187. All versions are listed on the Forge download page. Save the file, then navigate to your Forge directory. Run the setup command from the initial setup (setupDecompWorkspace and eclipse). Forge will update the necessary files. If the process fails, you may also need to update ForgeGradle. ForgeGradle is separate from Forge. Updating Forge alone will fail when updating between ForgeGradle versions. Save the file, then navigate to your Forge directory. Run the setup command from the initial setup (setupDecompWorkspace and eclipse). ForgeGradle will update the necessary files. Change the archivesBaseName field to your Mod ID, the same one as you put in your @Mod annotation. Alternatively, you can append a suffix of the Minecraft version to your archivesBaseName field instead of the version field. Go inside the Forge folder and run the following in command prompt/terminal. If this is not the first time you are building and ForgeGradle seems to ignore any changes you made to your build.gradle file, you need to run the following command beforehand. Backup your src folder first as it may be deleted. For more complex setups requiring other mods as dependencies, visit the #ForgeGradle or #MinecraftForge channels on EsperNet. New BlockState stuff currently in development, details coming Soon™. 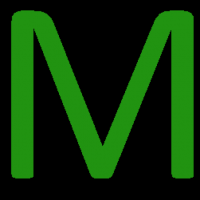 Mod metadata parsing has been overhauled and no longer supports the authors field. If you are still using it in your mcmod.info file, change it to authorList. Technically, authorList has been in FML since 1.5, but the wiki has not been updated to reflect this change. Goodbye block and item IDs! Those are now handled internally for you! Consequently, functions such as getBlockID no longer exist and have been replaced with a non-ID equivalent (in this case, getBlock). NetworkMod is gone. A more advanced networking library is available instead (Netty). If %userprofile% does not resolve to its actual value, you will need to use the absolute path. You can type it in Windows Explorer to resolve the directory. Scroll down to find your version of lwjgl (eg. [TT]lwjgl-2.9.1.jar[/TT]), click the arrow beside it, and double click Native Library Location. Follow what it says. Go to forge-directory/eclipse, open eula.txt and change [TT]false[/TT] to [TT]true[/TT]. Visit the #ForgeGradle IRC channel on EsperNet for questions and discussion on ForgeGradle. Now I need to make "one project per mod in the same workspace" work and modify the build.gradle file to work like I want it to and I'll be a happy camper. As of the time of writing, ForgeGradle does not yet support deobfuscating Minecraft, and so none of the usual Minecraft source files are there. That seems quite absurd to me, seeing as this is the official way to build and use forge as of the latest builds. The only mistake in that sentence (which luacs1998 has fixed) was saying deobfuscating instead of decompiling. At this point, ForgeGradle does not even decompile Minecraft, nor does it need to - you do not need access to Minecraft source code to run your mod. I'm having a problem where I select the root Forge directory I unzipped the Forge Source into, but it's not finding any projects to import. How do we even work on our mods if we can't see the MC src? They are working on an update where we can get a read-only access to the minecraft/forge source. Gradle Integration for Eclipse 03.4.0.RELEASE. won't install in eclipse right. So a.. that gradle plugin is still not working. I'm locking this thread, people are going off topic. Could a kind soul who is more experienced with ForgeGradle (AbrarSyed u.u) please create a "Common Problems and Solutions" thread please? Just followed the instructions to create a workspace. Needed to do the advanced setup. [21:07:32] [main/ERROR] [FML]: The binary patch set is missing. Either you are in a development environment, or things are not going to work! [21:07:34] [main/ERROR] [FML]: The minecraft jar file:/C:/Users/pieter/.gradle/caches/minecraft/net/minecraftforge/forge/1.7.2-10.12.1.1073/forgeSrc-1.7.2-10.12.1.1073.jar!/net/minecraft/client/ClientBrandRetriever.class appears to be corrupt! There has been CRITICAL TAMPERING WITH MINECRAFT, it is highly unlikely minecraft will work! STOP NOW, get a clean copy and try again! [21:07:34] [main/ERROR] [FML]: FML has been ordered to ignore the invalid or missing minecraft certificate. This is very likely to cause a problem! Is there anyway somebody can tell me where these files are being installed to, since the download always hangs, and I can just go in and download and put them in the right locations myself. thank you for this; the advanced initial setup finally worked for me after battling all last night trying to get the "simple" version to work on my mac. the only thing that's still going wrong is that i am not getting sound, but that's for another post; i think i saw something about that earlier. because 1.7 needs the access token, or the client will die. It works, and Minecraft Launchs Ok. But my "src" folder is empty, it only has "main" and no net.minecraft files and folders showing. Did anybody ever find oyut how to fix this? 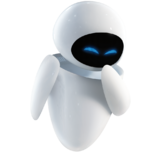 I've updated the thread to address [iurl=#troubleshoot]troubleshooting problems[/iurl]. You need an installer to run a command line command? Then you should not develop mods or any programs at all. Hey, I've been trying to get this to work for over a week now, and I figured I should post and ask for some help. What I'm trying to do is a little different than what this tutorial is for, in that I'm trying to contribute to a pre-existing mod, not create a new one. The mod in question is https://github.com/TechReborn/TechReborn, and while I got further using the "Advanced Initial Setup," I still can't get it working. What I've done is download the TechReborn package from github, run gradle to update dependencies and such, and then tried to follow the other directions. Unfortunately I'm stuck with an error "Could not find or load main class net.minecraft.launchwrapper.Launch." Is there some different process if I'm modifying an existing mod, instead of creating a new one? No, this hack is needed if you need to render something that cannot be expressed by a json model. Do not use it otherwise.